The Cristel Casteline stainless steel 7 piece cookware set with removable handles includes a frying pan, saute pan, sauce pan, two lids, and two detatchable handles. 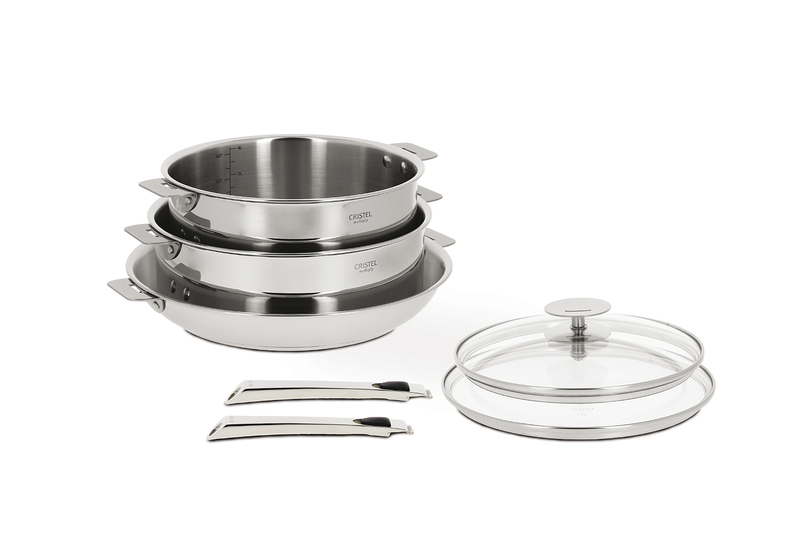 Each of the 3 pans in this set features fast and even heating thanks to the 5-layer construction of stainless steel and aluminum. They stack within each other for easier storage and they even take up less space in the dishwasher. You can depend on Cristel cookware for a lifetime thanks to the durable and long-lasting 18/10 stainless steel exterior of each pan. Cristel Casteline cookware is made in France and includes a lifetime warranty with normal us and proper care. Each Cristel handle also has a "double safety" so if you're holding up the cookware and press the handle release button, the handle will not release. Cristel Strate Brushed fully-clad cookware has a total of 5 layers of stainless steel and aluminum for fast evening heating. Three layers of stainless steel enrobing 2 layers of aluminum. Made in France and comes with a lifetime warranty.